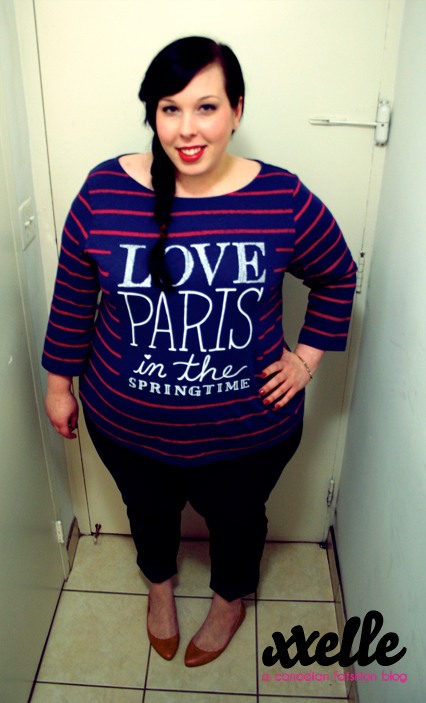 xxelle - a canadian fatshion blog: OOTD: paris...err toronto in the spring time. OOTD: paris...err toronto in the spring time. Here's what I wore on this particularly windy day in Toronto. It's a simple outfit, but I found it sweet for a cool springish day. 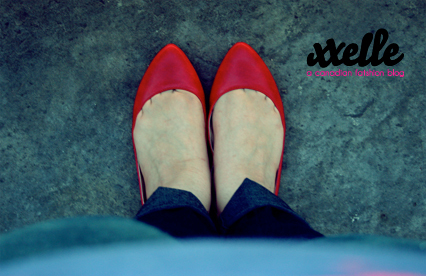 The flats are from Old Navy and are actually the cutest red flats I've found in the past couple of weeks, but I could only find my size online (10). If you follow me on twitter you probably already heard about my huge score at Penningtons, where I got a buttload of jeans for $7.50 a piece. The only jeans I paid full price for are the ones pictured above. I had a super awesome lady at the Dufferin location help me out in my search to replace my trusty jeggings and these were the closest fit, although I must say disappointingly wide around the ankles. I think I might wear it with a red rockabilly-esque hair scarf next time around, this was just quickly thrown together for a couple of errands. Have any of you fabulous ladies cracked out your spring wear yet? ps. Apple Bottoms wins the award for the WORST nail polish in existence. You're so sweet! Thanks for stopping by! love your blog. I followed you with google friend connect. and added my entries for the giveaway hehe, amazing little shop! The weather in Toronto around the middle of March can be so bipolar sometimes. whether it's spring or still winter, I have no idea. lol. love the top! super cute. haha soo true! stoked for this week's warm weather!